Physical activity is an essential requirement of our body. It makes one stay healthy, young, and fresh for a longer time. It is scientifically proven that through regular exercise, the age of a person can be increased. Not only the age but the fitness can also be maintained through proper exercise. Even the elder people who’ve been regular with working out in the past and are still performing regular walks remain healthy and free of all these muscular aches and joint pains. The regular exercise helps them with the strength to eliminate all the diseases from their body which may increase their living time. It boosts the energy of a person and increases stability by better blood circulation in the body, and it even improves the mood of a person at regular intervals. Physical work out reduces the risk of many diseases like type 2 diabetes, cancer, and cardiovascular disease. Exercise is vital for people of all ages even for pregnant women. It helps them in staying active and fit, and when we talk about their post-pregnancy time, and then all they want is to lose the extra weight gained. But you should be careful and should not hurry in this regard as it can affect the health of you and your new born. Here is a guide that can help you with the post-pregnancy workouts. There is one thing that you must know that irrespective of the type of delivery, you should take complete rest for at least one week after which you can start easy workouts but that too after the doctor’s consultation. The physician is well aware of your situation and can guide you better whether your body is in a position to start the workout or not. The basic workout is the regular walk. After one week of your delivery, you can simply start walking at home and then in the backyard. It will help you develop strength but you should never push yourself too hard. Kegels are another exercise that can prove to be very beneficial and it is quite easy to perform. You don’t have to leave your baby and go the gym; you can start doing it at home, in the same room as your child. Kegels specifically target the Pelvic muscles. Postnatal yoga addresses the physical challenges inherent to pregnancy, such as a shifted centre of gravity and lower back pain. These moves will help alleviate aches and will add strength to your legs, back, and abdominal region. What’s The Best Home Gym? Home Exercise Equipment Reviews can help you later on. Jim Roose is a former competitive powerlifter and gym owner. He is obsessed with physical fitness and healthy eating. He regularly writes about fitness secrets and much more at https://garagegymbuilder.com/. 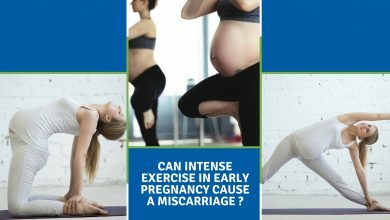 Can Intense Exercise in Early Pregnancy Cause a Miscarriage?